Missions to bring fresh supplies are expensive and time consuming. For any astronauts who take on a mission to Mars, planned for the 2030s, with the round trip likely to take two years, life would be even tougher. That prospect has helped focus minds at America’s space agency, Nasa, on clever ways to provide for daily needs in challenging conditions. But the lessons being learned are also proving to have knock-on benefits down here on Earth. Ms Coleman says space can be a fantastic “technology accelerator” – and that sustainable technologies devised by Nasa often find themselves repurposed for use on Earth. What can we learn from Nasa’s research? 1. Growing Food – Growing, harvesting and eating lettuces aboard the ISS using LED lights, same technology used in vertical farming. 2. 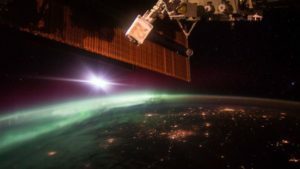 Clean Water – In space, water is in short supply, so Nasa has developed an innovative way to filter waste water on the ISS using chemical and distillation processes. This lets it turn liquid from the air, sweat and even urine into drinkable H2O. 3. Recycling Tools – Nasa is experimenting by 3D printing tools out of hard plastic on board the ISS. It is testing a trash compactor that melts down rubbish, such as plastic water bottles and foil drink pouches, transforming them into eight-inch-diameter tiles. 4. Green Buildings – Nasa’s Ames centre has constructed a green building on its campus in Moffett Field, California, where energy-saving technologies of the future are being tested.